Rebba Jo Dean, 85, passed away on Sunday, September 30, 2018. She was surrounded by her loving family at the time of her passing. A graveside service will be held on Wednesday, October 3, 2018 at 1:00pm in the Tuscola cemetery, Pat Voce officiating, directed by Fry~Smith Funeral Home, Tuscola. A visitation was held on Tuesday, October 2, at the funeral home. Rebba was born to Ole and Ola (Cantrall) Dean on April 29, 1933 in Taylor County, she attended school in Tuscola and graduated in 1951. She went to work for Timex after school. She met Johnny Dean and they married on November 28, 1952. Rebba and Johnny moved to Midland, where he went to work for Halliburton and then for Dean Machines and Rebba stayed at home as a homemaker and caring for Johnny and their two boys, Eddie and Bobby. The family enjoyed her great cooking and her love for the holidays, it was the family Sunday lunch that they enjoyed the most. She loved to camp, she loved to fish, but her heart was in the mountains. It was the mountains of southern New Mexico that she had the strongest affection for, spending weeks, several times a year, in Cloud Croft or Ruidoso. Johnny will tell you she loved to do everything he loved to do, Rebba would tell you Johnny loved to do everything she loved to do. They truly enjoyed each other. 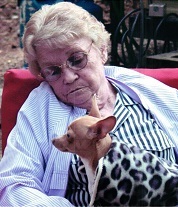 Rebba is survived by her husband of 66 years, Johnny Dean of Midland; sons Eddie and wife Sheila of San Angelo, and Bobby Dean of Midland; and several nieces and nephews'. She is preceded in death by her parents, brothers Grady and Alfred, and her sister Irene.